Consider an Art in Mind Private Party! Our goal is for you and your guests to enjoy a relaxing few hours having fun and creating your very own masterpiece, whether in our studio or off-site. You won’t feel crowded or rushed; our patient instructors will gently guide the parties step by step, from start to finish. Call us today to learn more about how we can help you plan the perfect experience. Come celebrate with us creatively for your birthday party! Hosting parties is one of our favorite specialties here at the studio. It is always amazing to watch the unique creativity of a young artist come to life with a paint brush and canvas! Their creativity also blooms when making unique pieces of jewelry or whipping up a culinary delight! A dedicated party host (so you can relax)! See our our Painting Gallery page for painting options! Be chefs by having a Culinary Party! Adopt a Pet Party! NEW! Pizza Pizzaz: Chefs will each create their own personal pan pizza completely from scratch (dough & all) to take home and bake. Delicious Desserts: Chefs will create treats based on the holiday of the month or based on a theme the birthday child chooses. Please bring your own gifts, treats, and drinks, but leave the rest to us! Have your artists arrive 5-10 minutes before scheduled party time, as it can be very exciting to visit the studio. Please pick up your children up promptly, as other events may be scheduled. A 50% non-refundable deposit required. Hosting parties is one of our favorite specialties! Trust us to completely prepare you to host a party of your own at home! We know how busy life can be and how much time goes into planning the perfect birthday party or other special event for the young artists in your life. With a Paint Party To-Go you can leave the planning to us. That's right… we will do ALL the prep work and provide you with ALL supplies needed for you to host the best paint party ever on your own!! Great for BIRTHDAYS, GIRL SCOUT BADGES, SLEEPOVER ACTIVITIES, & SPECIAL EVENTS! There will be step by step instructions...no worries...each artist will feel like Picasso! You just choose the painting and pick up the prepared package from us. See our Painting Gallery page for painting options! Minimum of 20 good quality paint brushes - $6 cash back for returned brushes! Bottles of each paint color needed for chosen painting - $3 cash back for returned bottles! Thank you for considering an Art in Mind Private Party! Our goal is for you and your guests to enjoy a relaxing few hours having fun and creating your very own masterpiece, whether in our studio or off-site. You won’t feel crowded or rushed; our patient instructors will gently guide the parties step by step, from start to finish. WE supply canvas, brushes, paints, apron, easel and step-by-step instruction. WE set up/clean up. Really, you leave everything behind, we do ALL the clean up! YOU (or your guests) supply the snacks, cake, drinks, etc. WE have wine cups, ice & an opener, as well as flavored coffee and a water cooler. WE close the studio for your event. You have the entire venue all to yourself for 2 ½ hours. Arrive up to 15 minutes early to decorate (no confetti please) or to drop off food/drinks/cake. Please invite your guests to arrive up to 10 minutes before your scheduled party time. Painting typically begins 15 minutes past your party start time, giving your guests time to settle in. There will also be about 15 minutes after your paint time to relax and socialize with friends, or to continue working on your painting. Socialize, eat, open gifts, sip, snack, paint & enjoy! Each attendee will leave the party with the masterpiece they painted themselves! Our host/hostess will be snapping a few photos at your party which we will later upload to Facebook. If for any reason you DO NOT want photos taken party please let the hostess know when you arrive. Canvas sizes are typically 16″x20”, but you always have the option of exchanging sizes in advance. You may alternatively elect to paint wine glasses, board art, slate painting, or jewelry making! Want additional party time? Let us know when you book the party, time extensions might be available for a flat fee of $30 per half hour. The cost for a Private Party is typically $35.00 per person. All Private Parties on a weekday require a minimum of 6 paid guests. Friday & Saturday Nights require a minimum of 12 paid guests. A $150.00 deposit is due at time you book your date, the balance is due on day of your party. Your $150.00 deposit is 100% refunded on the day of your event, provided you meet the minimum guest requirement. We accept cash, check and credit cards at the studio; guests can pay individually when they arrive. Please see Private Party FAQ’s for payment/cancellation details. We are often asked about tipping the instructor. Tips are very much appreciated, and 100% of tips stay with the instructor. We require a $50 travel fee for off-site events. Can my guests register and pay for my event online? Once we have received your deposit and painting selection, we can create a private party registration link so your guests can register and pay online. Please understand that there are no vouchers, gift certificates or discount codes allowed as payment towards private parties. pushed together during our public calendar paint party events. What if I need to cancel my event? If you make your deposit then need to cancel your party, a full refund, minus any transaction/supply fees that we have incurred, will be issued if your cancellation is made 10 days prior to event date. Please understand that if you cancel / postpone / reschedule your private party with less than 10 days notice, we cannot refund your deposit, unless we find another party to take your time slot. If we do book another party, we will refund your full deposit, minus any transaction/supply fees we have incurred. Our studio comfortably seats 30, though we can add an additional table if requested. We have off-site accommodations for 50+ people. Our studio is BYOB and we sell wine/beer, however, only adults 21 or older may consume alcohol. We reserve the right to card; please remember to bring a valid photo ID. Age Policy for Private Parties: There are NO age restrictions on private parties, even if alcohol will be present, all ages are welcome. We trust that you will monitor your children. Only adults 21 or older may consume alcohol. You may choose for your event to be “adult only. 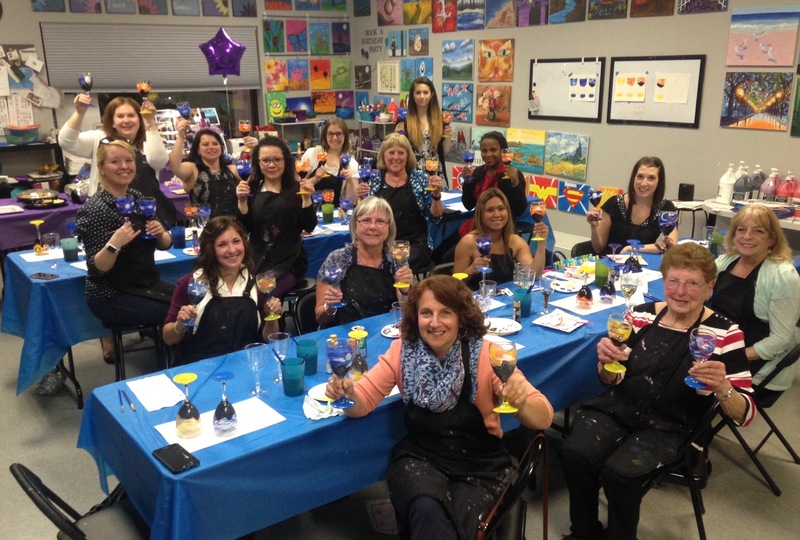 An Art in Mind Fundraiser Paint Party is our way of giving back to the community. At Art in Mind Creative Wellness Studio we strongly believe in supporting our local area. We think that creating beautiful works of art while raising money for a great cause is an amazing combination! An Art in Mind Fundraiser has great potential to earn money for your organization. Our fundraisers cost $40.00 per person. They are held Sunday through Wednesday nights and require a bare minimum of 10 full paid guests. As long as 10+ painters attend, you will receive $10 from each registration. If 20+ painters attend, you will receive $12 from each registration. If 30+ painters attend, you will receive $14 from each registration. And if 40+ painters attend, you will receive $16 from each registration. The more painters that attend, the larger the donation—it’s that simple! WE provide a talented host, canvases, brushes, paints, aprons, easel and step-by-step instruction. WE provide a website link for registration and payment online. WE provide at least two Facebook advertisements before the date to help promote your event. WE close the studio for your event. You have the place all to yourself OR we can come to you! YOU agree upon a date with us at our studio or secure a venue with ample space/tables/chairs. YOU (or your guests) supply the food, snacks, drinks, etc. (We find more people will attend if snacks and drinks are provided.) *Please note- all publications must be approved by us and they must note that all food/drinks are provided by you - not Art in Mind Studio. Because this is YOUR fundraiser, we expect that YOU will publicize the event, encouraging friends & family to attend. We will also do our best to advertise your fundraiser. A $150.00 deposit is due at time you book your date; the balance is due on the day of your event. Your $150.00 deposit is 100% refunded on the day of your event, provided you meet the minimum guest requirement of 10. If the fundraiser is for a business, a liability waiver must be signed/ insurance cert. presented. If off-site both you as the host, and the owner/manager of the venue, must agree to sign our liability waiver. Our host/hostess will be snapping a few photos at your event which we will later upload to Facebook. If for any reason you DO NOT want photos taken please let the hostess know. Please see fundraiser FAQ’s for payment/cancellation details. event? We are committed to hosting one fundraiser a month. Please plan your fundraiser months ahead of time. The longer your fundraiser is on our calendar, the more likely it will be a success. Fundraiser dates are awarded on a first-come first-served basis, totally at our discretion. Because our fundraisers are so popular, requests cannot always be honored. Can fundraiser guests register and pay for my event online? Once we have received your deposit and painting selection, we can create an event registration link so guests can register and pay online. Please understand that there are no vouchers, gift certificates or discount codes allowed as payment towards fundraisers. Can fundraiser guests pay when they arrive? We accept cash, check and credit cards at the studio; guests can pay individually when they arrive. If they are planning to do this, please ask them to confirm that they are coming in advance to allow for an accurate roster. What if I do not have enough people for my event? Unfortunately, if less than 10 PAID guests are registered by 24 hours prior to the event start time, we will have to cancel the event. In this case, we will send out a cancellation email to all those registered, and will refund anyone who prepaid online. If we cancel at the last minute like this, unfortunately your deposit would be forfeited. transaction/supply fees that we have incurred, will be issued if your cancellation is made 10 days prior to event date. Please understand that if you cancel / postpone / reschedule your event with less than 10 days notice, we cannot refund your deposit, unless we find another party/event to take your time slot. If we do book another party/event, we will refund your full deposit, minus any transaction/supply fees we have incurred. Our studio comfortably seats 30, though we can add an additional table if requested. We have off-site accommodations for 50 people. There are NO age restrictions on these events, even if alcohol will be present, all ages are welcome. You may choose for this to be an “adult only” or an “alcohol free” event.